Reading to premature babies is so beneficial and books are a perfect gift idea for family and friends. Studies support that reading to premature babies is beneficial too. Reading helps parents to bond with their baby. The baby hears the familiar voices of Mum and Dad which can help to settle them. Premature babies that were read to in the studies had more advanced communication skills when older than those that were not read to. This is why I was excited when Nicola Rowley agreed to be Presents For Preemies book of the month. I decided to feature her second book James and the Birthday Balloon! James and the Birthday Balloon eBook version has become a top 5 Amazon.com Best Seller in its category. The book has a reassuring message for any child faced with having to go to hospital. It tells how James saves the day with a small act of kindness and a smile that soon spreads through the wards and A&E. The free audio book of the story, which accompanies the paperback version, has been narrated by TV presenter Dr Ranj Singh (CBeebies and ITV’s This Morning). James and the Birthday Balloon is the second book in the James and the… series and follows on from the hugely successful James and the Amazing Gift (Matador 2016). The first book had rave reviews from mummy bloggers in the UK, US and the United Arab Emirates. It was highlighted by celebrities including Michelle Heaton, Laura Hamilton, X Factor winner Sam Bailey, and TV presenter Amanda Lamb. One pound from every copy of James and the Birthday Balloon, helps support Evelina London Children’s Hospital. The hospital provides care and life-saving treatment for children in south London and beyond. 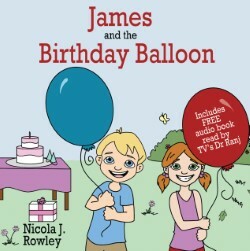 The eBook version of James and the Birthday Balloon went to number five in the Amazon.com Best Seller list in its category on its publication day. With every paperback copy the audio version of the book comes as a free bonus.